Huge self-propelled mining platform, can drill for ore on any sea at maximum depth. Using the power of autostruts it’s possible now to keep a drill head connected to a ship and just let it sink to any depth. On Kerbin the max depth is ~1200m. The cable is even longer than that. Yes, part count is high. The cable has most of it. You can reduce part count by deleting stuff from the superstructure you don’t need. For example the walkway has a bunch of emergency lights (they’re just folded up ladders). 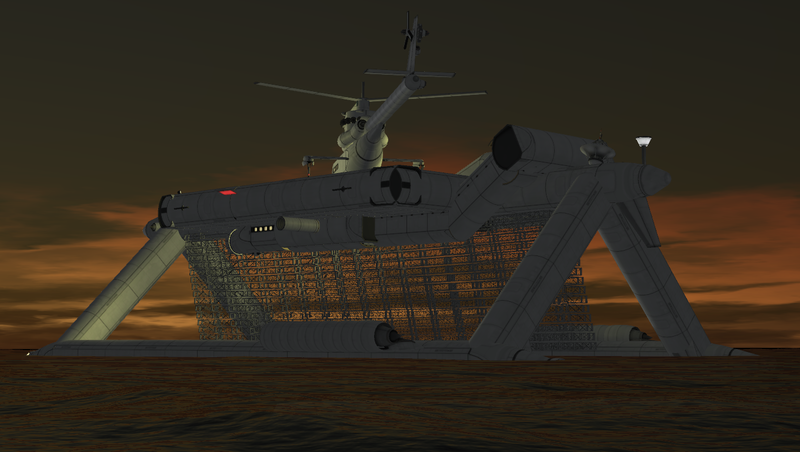 The ISRU is located behind the crew cabin. Please notice: Part Pressure Limits needs to be OFF (Difficulty options -> advanced). Also, you need advanced tweakables enabled. Sail to the location with ore.
Use the console to visualize the autostruts (Alt-F12 -> Physics). Disable all the autostruts on the cable . Doesn’t matter which sequence. The drill starts sinking. This takes time. You can speed it up using physics acceleration (ALT- >). Do not use more than 3x. Make sure you enable the fuel cells, the solar panel and the radiator. Normal time acceleration resets the cable and drill to it’s original location! Also when moving out of physics range or going back to menu. Use this to your advantage. If you’re done drilling, set a number of cable elements and the drill to Autostrut: Heaviest Part . With the cable extended, use Aim Camera to navigate along it. Oh and forget about Laythe. The seas over there are more than twice as deep.